What is a project management software? Any project involves different things like time, money, documents, employees, resources, clients and stakeholders, invoices, reports, and more. To manage everything manually is cumbersome and time consuming. A project management software aims to make the process easier and more refined by providing tools that take care of planning work items, tracking progress, managing schedules, monitoring work hours, storing files, generating invoices. In short, a project management software is a 360-degree solution for all project needs. Are you stuck with a painful project management software? Our online project management software helps you stay on top of your projects with its simple and intuitive interface. 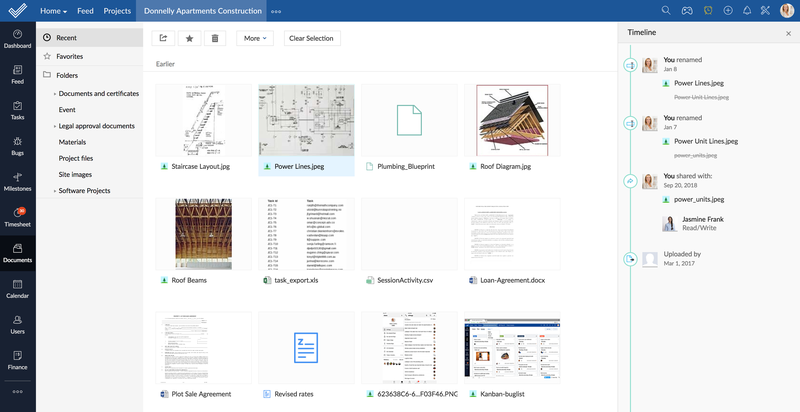 With Zoho Projects, keep track of your project deliverable, connect better with the collaboration features, log time using timesheets, upload documents to the cloud, discuss ideas, post comments, and do much more. Creating a project plan is the first thing you should do for any project. Often we ignore a project plan in favor of getting on with the work. We fail to realize the value of a project plan in saving time, money, resources, etc. With Zoho Projects as your project planning software, you will have more time to do real work and less time managing it. The core purpose of a project template is to capture all the actions that need to be accomplished right from the inception of the project till its completion. Templates are a boon to project managers as they help save time, energy and money. You can save any project as a template and later choose from the saved project templates while creating a new project. You need to know, which projects you are working on, what type of work you are doing so that you can easily identify the actual working hours. You must have a simple online time tracking software where you can log working hours, easily run reports, and bill your clients. Zoho Projects offers time tracking functionality that streamlines the performance of a project, calculates time spent on tasks, exports timesheet data in the desired format and sends an invoice for client payments. Zoho Projects helps you easily organize and work on files associated with a particular project. No more version confusion, e-mailing files to yourself, or sorting through your inbox trying to find a crucial approval document from months ago. You always have instant access to the latest file versions—and can quickly see what others have changed. Team members who are scattered across need a way to interact with teammates even when geographically separated. Zoho Projects solves this challenge with an online interactive forum where one can post a topic, discuss critical ideas and help capture the knowledge in one place. Gantt and resource utilization charts visually represent your team progress against your pre-defined goals and provides comprehensive summary reports about tasks, milestones, tasks lists completed, files and disk usage.